Publisher and Title: Italian Spads at War! 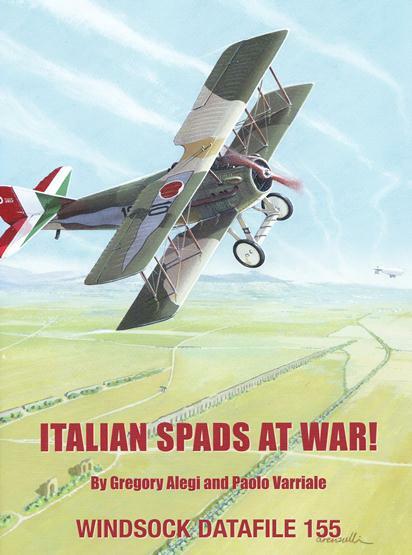 Advantages: Interesting and informative text; superb collection of period photographs; close-up images of various airframes; detailed scale plans in 1:72 and 1:48 scale for the Italian Spad VII; inspirational artwork. Louis Bechereau’s brainchild was not the main fighter type used by the Italians in World War I. In fact, Italy never had more than 3 all-Spad units throughout the entire war. Despite 4 of the leading 6 Italian aces having used the type, it only accounted for about one-fifth of the total number of victories in combat. With 32 pages at their disposal, Gregory Alegi and Paolo Varriale have combined their talents to offer this new study of the Spad VII and XIII in Italian service. Between the soft card covers are nearly 90 period black and white photographs plus another 19 in colour. These latter images are from surviving examples found in museums. The reproduction is excellent and most readers will find photos that they haven’t seen before. The captions are informative and compliment the text rather than just repeating it. The indefatigable Martin Digmayer supplies a set of scale plans in both 1:72 and 1:48 scales. These cover the Spad VII and include “early” as well as “late” versions. These drawings are up to his usual high standards and include additional views where necessary. Three pages of aircraft profiles come courtesy of Ronny Bar. His inspirational artwork showcases 4 Spad VIIs and 3 Spad XIIIs, the former including upper and lower images. Importantly, the author has used the pioneering work of Alan D Toelle to replicate the French colours worn by the vast majority of Spads in Italian units. The narrative is easy to understand and, as the title suggests, concentrates on the wartime services of these fighters. A “Colours and Markings” section is included to explain the various schemes applied to each aircraft. Original French practices are touched upon but the main conversation centres on how Italian painting practices differed from their French counter parts. Sometimes it can be problematic to quote comparable Federal Standard and Methuen colours so the authors have also included CMYK colour co-ordinates. This is an excellent publication that is the culmination of 25 years of research. It’s been authored by two of Italy’s top WWI aero historians and the results are testimony to their dedication. If you have the slightest interest in Spad VII or XIII aircraft, then this publication is for you.